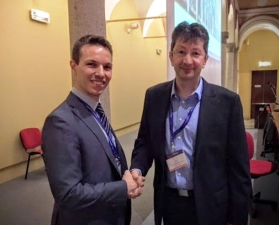 The 2016 ENCALS Young Investigator Award has been awarded to Francesco Pagnini for his work on mindfulness in ALS. Pagnini is Assistant Professor at the Catholic University of Milan. The chair of the prize committee, Prof. Ammar Al-Chalabi, congratulated Pagnini with his important contribution to a better understanding of when and how we can help patients to cope with their devastating disease. Dr. Pagnini is Assistant Professor at the Catholic University of Milan and collaborate as post-doctoral fellow with Harvard University. He has completed his Ph.D. in Clinical Psychology from the University of Bergamo. His primary interest is focused on the improvement of psychological well-being of people with ALS, in particular with interventions that improve mindfulness. Francesco Pagnini has many publications that contribute to better knowledge of how psychological interventions can help patients cope with their disease. For the first time, the ENCALS award committee acknowledged two Siver medallists, as the competition was extremely close. 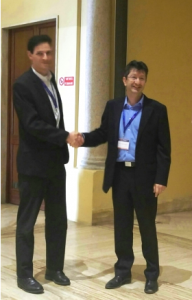 Dorothée Doorman from Munchen, and Peter Bede (photo) from Dublin, were acknowledged as Silver medallists for the ENCALS Young Investigator Award 2016. The ENCALS young investigator award was designed to recognise the brightest and best young scientists in ALS, and is given for outstanding research. It is judged by the ENCALS award committee, an international panel of experts. Criteria include any or all of novelty, challenge to existing ideas about ALS, results with patient benefit, and impact on our understanding of ALS. All of these high profile researchers have been continuously dedicated to ALS research and strengthen the ENCALS network with their involvement in international research collaboration.